Description: NS 7044, 5324 and 5345, as seen through my passenger car window, sitting the yard at Charlotte. 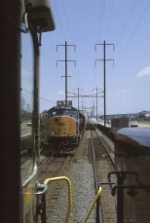 Description: A look out the cab of the NS H14's PRR 5345 as CSX intermodal train CSX Q191 races down the ex-PRR Passaic & Harsimus Line. Description: C46 completed work at Island Ave in Pittsburgh, now returns east to CP Rade. Description: NS local C46 heads east to Latrobe. Description: Local job heads east to work CP Rade where it will interchange with the SWP. Description: NS 206 has a restricting signal as it prepares to take headroom at CP-BD in order to set off cars for Taylor. On the left, NYS&W power can be seen, along with an NS GP38-2 and a BNSF ES44AC (the latter of which will be added to the NS 31T/CP 931). Description: The local rests in the siding at Centralia. Description: NS D67. This photo was actually taken in O'Fallon Missouri but the uploader would'nt accept that name of town. Description: A pair of NS geeps pull a local with loaded steel coil cars. Description: NS 5345 brings a string of cars from the A.O. Smith Yard and heads for US Steel Works across town. Title: D66 Crossing Elizabeth Ave. Description: About 25 minutes after Train 224 rolled though, D66 was ordered to proceed eastbound from Berkeley toward Luther. As soon as the engineer told the dispatcher "Clear at Ferguson" (meaning he was passing the signals near Whistle Stop Cafe), I raced over to Ferguson and Godfrey to get a shot of NS 9290 (a C40-9W) and NS 5345 (a GP38-2) hauling the train across Elizabeth.